Can you see the shape of a hand in this new X-ray image? 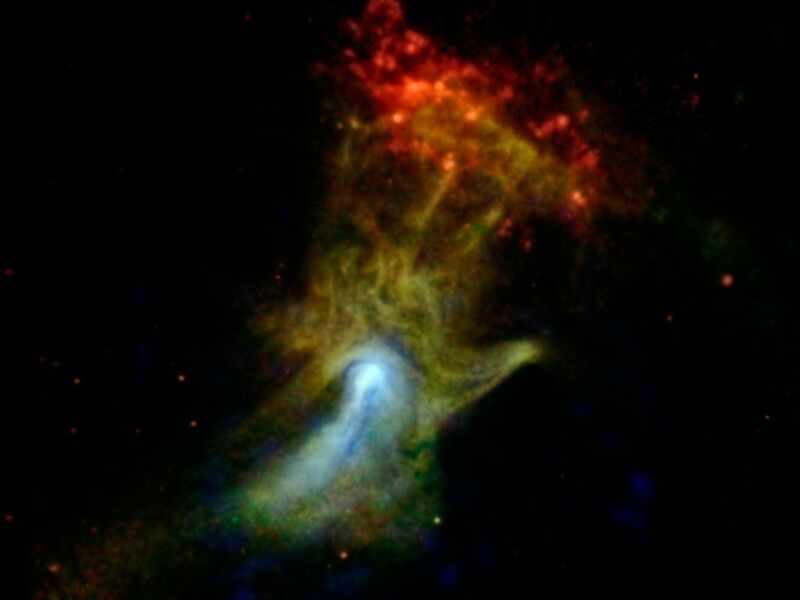 The hand might look like an X-ray from the doctor's office, but it is actually a cloud of material ejected from a star that exploded. NASA's Nuclear Spectroscopic Telescope Array, or NuSTAR, has imaged the structure in high-energy X-rays for the first time, shown in blue. Lower-energy X-ray light previously detected by NASA's Chandra X-ray Observatory is shown in green and red. 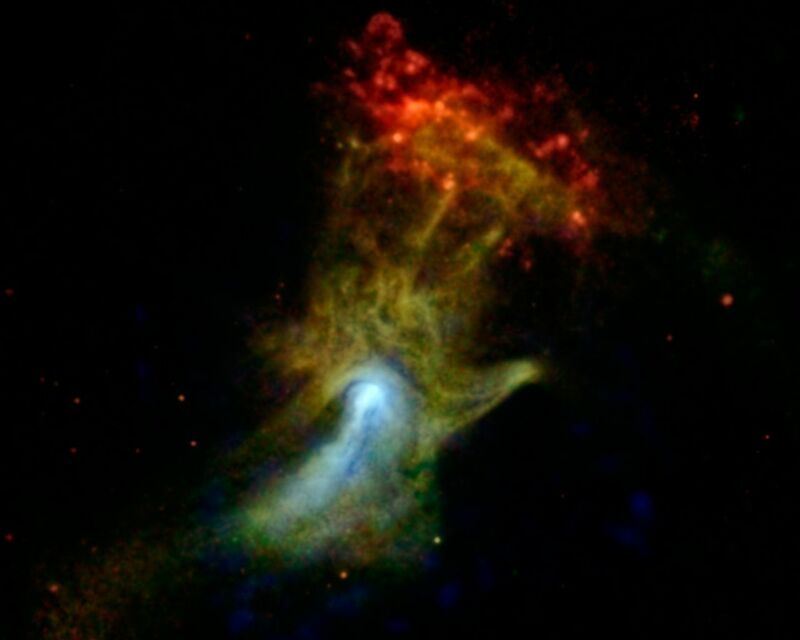 Nicknamed the "Hand of God," this object is called a pulsar wind nebula. It's powered by the leftover, dense core of a star that blew up in a supernova explosion. The stellar corpse, called PSR B1509-58, or B1509 for short, is a pulsar: it rapidly spins around, seven times per second, firing out a particle wind into the material around it -- material that was ejected in the star's explosion. These particles are interacting with magnetic fields around the material, causing it to glow with X-rays. The result is a cloud that, in previous images, looked like an open hand. The pulsar itself can't be seen in this picture, but is located near the bright white spot. NuSTAR's view is providing new clues to the puzzle. 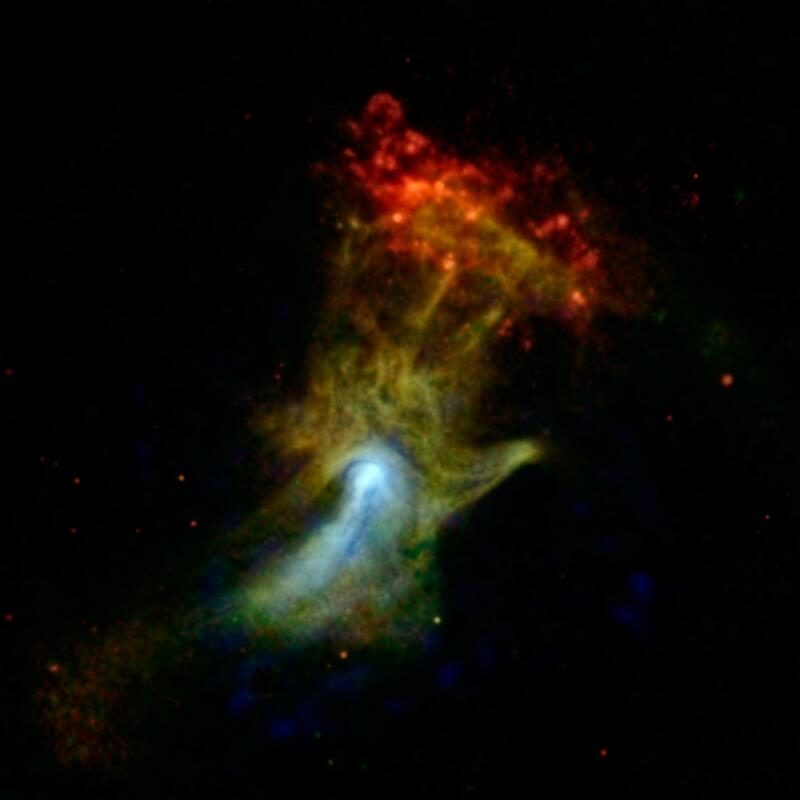 The hand actually shrinks in the NuSTAR image, looking more like a fist, as indicated by the blue color. The northern region, where the fingers are located, shrinks more than the southern part, where a jet lies, implying the two areas are physically different. 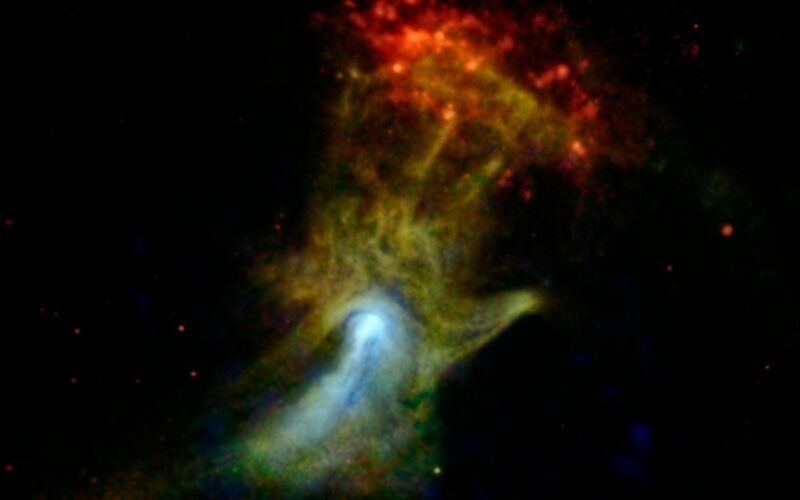 The red cloud at the end of the finger region is a different structure, called RCW 89. Astronomers think the pulsar's wind is heating the cloud, causing it to glow with lower-energy X-ray light.